Demographics of the province of Prince Edward Island, Canada. According to the 2011 National Household Survey, the largest ethnic group consists of people of Scottish descent (39.2%), followed by English (31.1%), Irish (30.4%), French (21.1%), German (5.2%), and Dutch (3.1%) descent. Prince Edward Island is mostly a white community and there are few visible minorities. Chinese people are the largest visible minority group of Prince Edward Island, comprising 1.3% of the province's population. Almost half of respondents identified their ethnicity as "Canadian." Prince Edward Island is by a strong margin the most Celtic and specifically the most Scottish province in Canada and perhaps the most Scottish place (ethnically) in the world, outside Scotland. 38% of islanders claim Scottish ancestry, but this is an underestimate and it is thought that almost 50% of islanders have Scottish roots. When combined with Irish and Welsh, almost 80% of islanders are of some Celtic stock, albeit most families have resided in PEI for at least two centuries. Few places outside Europe can claim such a homogenous Celtic ethnic background. The only other jurisdiction in North America with such a high percentage of British Isles heritage is Newfoundland. Information taken from the Canada 2001 Census..
* These percentages sum to more than 100% due to dual responses (e.g. "French-Canadian" generating an entry in both "French" and "Canadian" categories.) Groups with greater than 1,000 responses are included. Mother tongue in Prince Edward Island (red: English, blue: French). 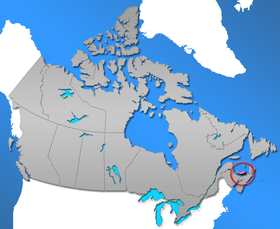 The only part of the province to have a Francophone majority is the so-called Evangeline Region. The 2006 Canadian census counted a total of 4,785 immigrants living in Prince Edward Island. There were also about fifty-five immigrants from Denmark; about fifty each from India, Japan, and Poland; about forty-five each from Hungary, Sierra Leone, and Syria; and about thirty-five from Zimbabwe. Information taken from the 2001 Canadian Census. The Roman Catholic Diocese of Charlottetown comprises the entire Island and is the second oldest English diocese in Canada. The Archdiocese of Kingston is the oldest. ^ Population urban and rural, by province and territory (Nova Scotia) Archived 2006-11-21 at the Wayback Machine. Statistics Canada, 2005. ^ "2006 Canada Census: Community Profiles". Statistics Canada. March 13, 2007. Retrieved November 3, 2017. ^ "2006 Census: Aboriginal Population Profile". Statistics Canada. January 15, 2008. Retrieved November 3, 2017. ^ a b "PEI 2001 Canadian Census". Archived from the original on 2007-03-23. Retrieved 2007-01-29. ^ "2006 Census of Canada: Topic-based tabulations". statcan.ca. Retrieved 4 July 2015. ^ "2006 Census of Canada: Topic-based tabulations". statcan.ca. Archived from the original on 11 February 2009. Retrieved 4 July 2015.